Console yourself that you have saved loads of money for what is a completely meaningless match. I would like to see OKane get three games to show what potential he has for next season. I haven´t tipped one right all season and am worried I might get a reputation for being the worst tff member tipper - lets see if I can get one right before the end of the season - I´m going for a 2-0 home win! The sky is looking a bit grey here in the Bay today, but I’m sure the sun will be out later and it will be a pleasant afternoon up at Plainmoor. This will be my last game for this season as I want to watch Ant play for Ipplepen against Marldon on the afternoon of the Notts match. Its hard to take a guess at how many fans will be at the game today, I’m sure some will just feel it’s a nothing match and won’t bother to come, but I hope we do see a good gate and they give the players and manager a very loud welcome when they come out for the game to show their appreciation for all the effort and hard work put in to secure our league status. I’m sure Bucks and the players will want to keep our winning run going and see us move a bit further up the table, but no one will go home too unhappy should be not win this game. 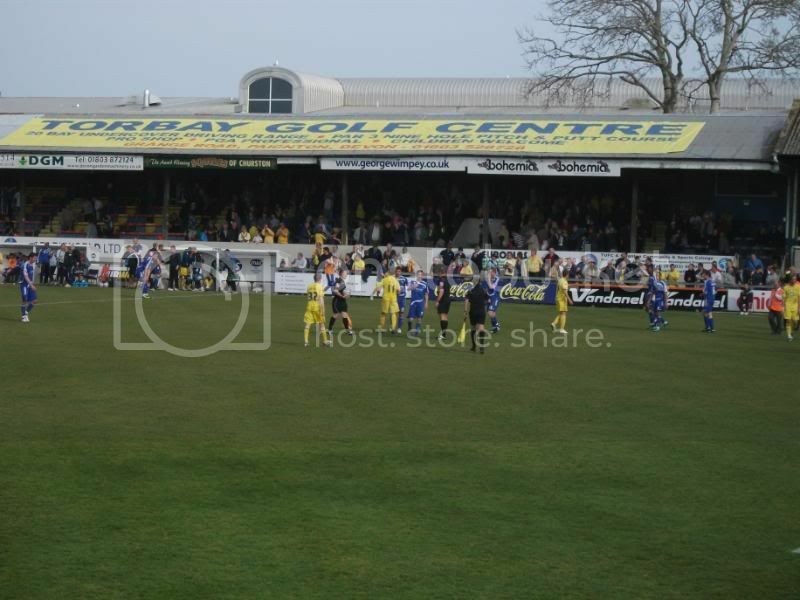 It was so special for our first home gate this season arriving at the ground and feeling so proud we were a league club again and Plainmoor was once again was a league ground. The day was made all the more special as we had a TFF carvery day and Merse was down for the game and to top it all off we played well and deserved our win. There have been too many late goals that sent us all home from a lot of home games heart broken and gutted and I’m really hoping for my final game today I see a great win and a great performance by the team. I hope we get some great match reports today and also for our two other remaining fixtures and I thank all those who have this season made our match day threads such a good read with such quality match reports and pictures etc. The games that we have played have been played with ahigh tempo, a gerat workrate, tightly organised at the back and far more lethal going forward than we have looked for some considerable time. Branston will be missed today - if the game had anything other than pride and the necessity to continue the momentum then he would be a very big miss. I think having Charnock back - someone that we have under contract for next season and has looked decent at times will be interesting. Will Ellis continue to produce the fantastic performances that he has in recent months with Branston as his partner and will Robertson be able to play a discipled right-back role? Now the pressure is off I hope that we can still get a couple of wins out of the last 3 games to keep the feelgood factor that is starting to come back. Macc has pulled away from the dropzone earlier than us but have kept on getting some great results - I'm glad for them after the death of Big Keith which must have been devestating. I'm looking forward to this game with as has been said "Torquay on Fire" at the moment.This (hopefully) will be some Fun in the Sun for us the TUFC Faithful.Benyon is on fire and his teamates. 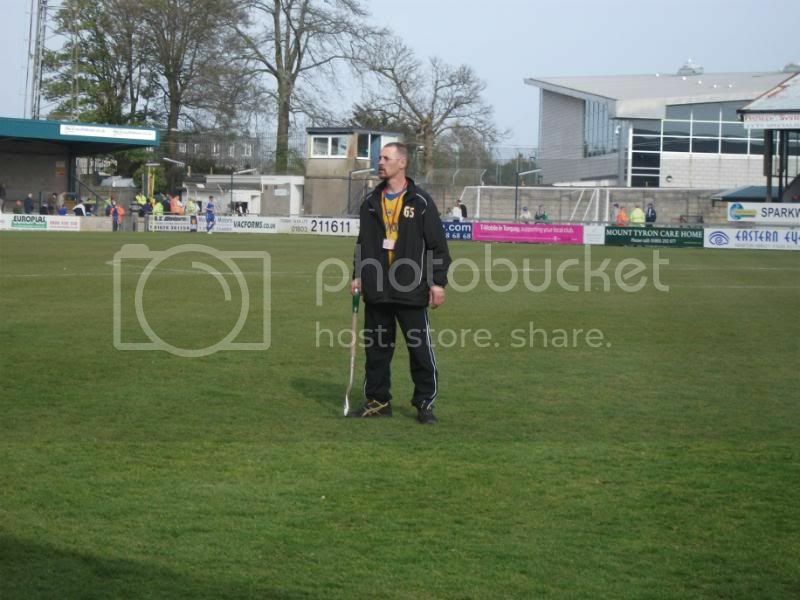 If we end the season well and I can see no reason why not then most if not all the Torquay fans will start to be in a positive mood for next season. ;)Crowd 2850ish today. Sounds like Wroe has scored the goal of the season! Given the chances that we created it was a great that we managed to keep going until the end and finally win it with a bit of quality. So many times earlier this season it would go the other way. All credit to the team to keep going and beat a team that has been in outstanding form themselves. I think BUry could be in for a shock next week - I wouldn't fancy playing us knowing that a win was vital if I were them. It's a little bit of a shame that Rochdale were beaten at Hereford - it would have been great to go into the Notts County game and rain on their parade (especially lee hughes). Also great to hear Guy do the half-time draw with Kenny Allen and get a great reception - weird - I'm sure that I recall the last time he did that he was boo'd? Humble pie for those "supporters" today I think!!! No sign of Thomson (no surprise) or Smith on the bench today. I guess that's the end of their involvement this season. Other news around the country - Forest Green relegated courtesy of Oxford's defeat at Eastbourne and their inability to beat whipping-boys Grays. I hope they can overcome their financial problems as I had a few great visits there (and an unforgettable night with Sills in goal, a penalty miss for Riggoglioso and two stunning goals by Benners and Green). There's a steely determination running through the squad at the moment that bodes well for next season if we can keep this group of players together and performing like they are. 1- 0 could have been four five or six quite easily with 13 attempts ON TARGET to there 0. Their goalie saved their skin on numerous occasions and any other result would have been a complete injustice. Mussy once again ran their defence ragged but I fear this will be the last we see of him this term at least as he went off looking troubled with, what looked like a bad knee injury. A class strike won it in the end from a Wroe strike hit from just outside of the box low to the keepers left . No chance! Another hard working and skillful performance with everyone again playing there part, a real team performance. Only worry today was Mussys injury though it is at least at the right end of the season thank goodness he has been instrumental in our recent performances and a joy to watch and I wish him well . Already looking forward s to next season with one more all important clean sheet to add to the stats. Wonderful! I thought the team showed much character today to keep going until they finally got their rewards in a much deserved win. It was pretty much one-way traffic throughout the entire match and only the Macclesfield keeper, Brian, kept the score even for so long. Then up popped Nicky Wroe with 5 minutes to go to finally beat Brain with a thumping low shot in the bottom right hand corner from about 20 yards. Even Brain could not reach that one such was the power of the shot. I don't know what the crowd was or indeed who the sponsors MOTM was as the tanhoy at the Family Stand end was not working ! Torquay showed their intent in the first few minutes of the match by testing Macclesfield's keeper with some decent shots and having a number of corners and long throws from Nicholson. The game evened out more as the half progressed into mainly a midfield battle but Torquay should have gone into half-time at least a goal up. Our chances tended to be on target but Brain seemed to be in the right place at the right time to typically parry out the shot. Rendell had the best chance in the first half but from close range he could not beat Brain. 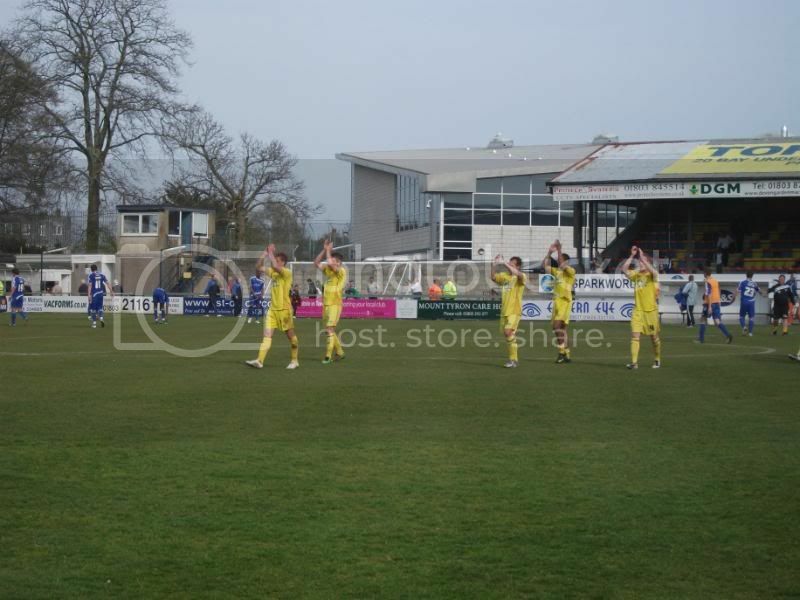 Apart from a few long throws Macclesfield did not threaten at all and Torquay typically dealt with them well. 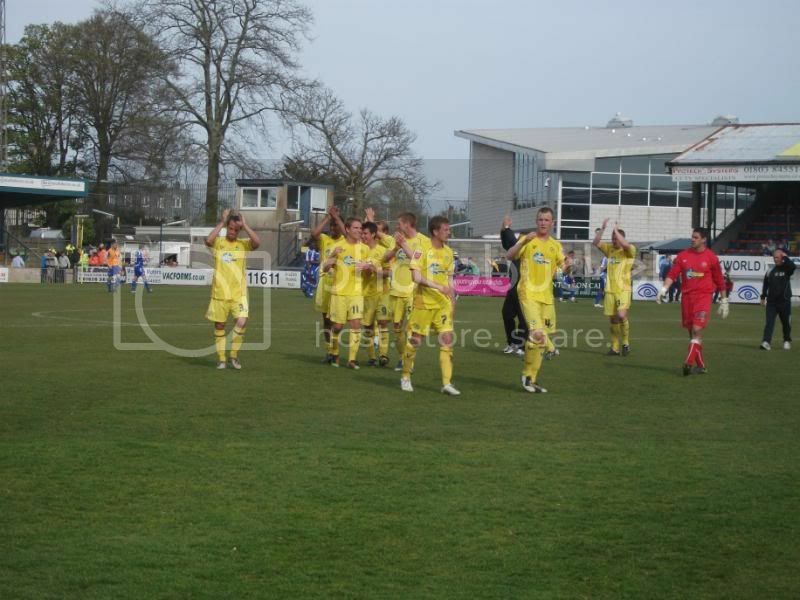 As the second half progressed it was a case again if Torquay could find the breakthrough. Chances came and went again. Zebroski should have headed in from close range but headed wide, as Torquay cranked up the pressure. Carayol was again showing some lovely skill beating defenders with clever footwork. Benyon uncharacteristically blasted high and wide when through and you wondered where a goal was coming from. The ball was so often in the Macclesfield penalty area but somehow Macclesfield, mainly thanks to their keeper again, kept it out. 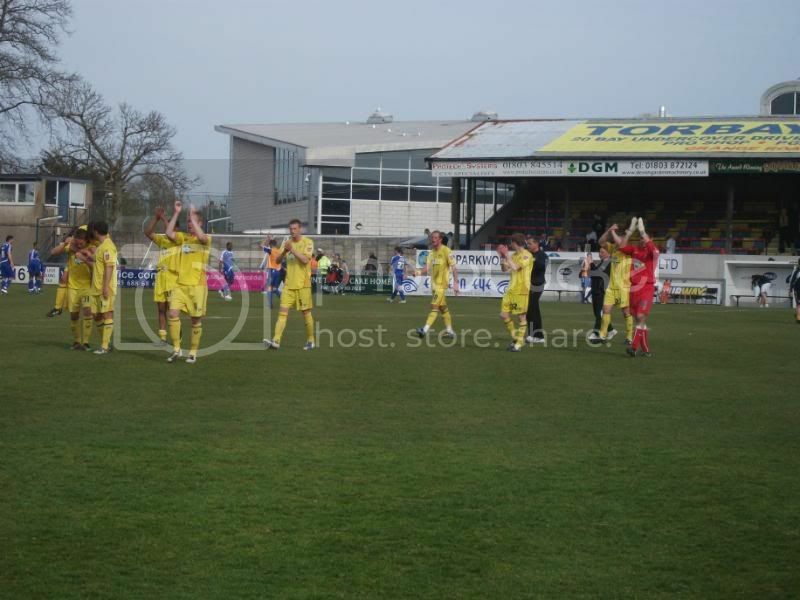 Rather than slacken off Torquay actually upped the pressure even more and you felt something had to give. Macclesfield only had one shot of note, a decent long range shot that just dipped over the bar. Then finally Wroe did the business and it had to be something special to beat the inspired Brain in goal. Sadly Carayol went off injured and was replaced by OKane who showed some great vision with his range of passing. Even in injury time Rendell hit the post and Brain saved the rebound. Macclesfield hardly threatened at all as the game was played in their half almost entirely. So another victory, another impressive performance and team effort to match. 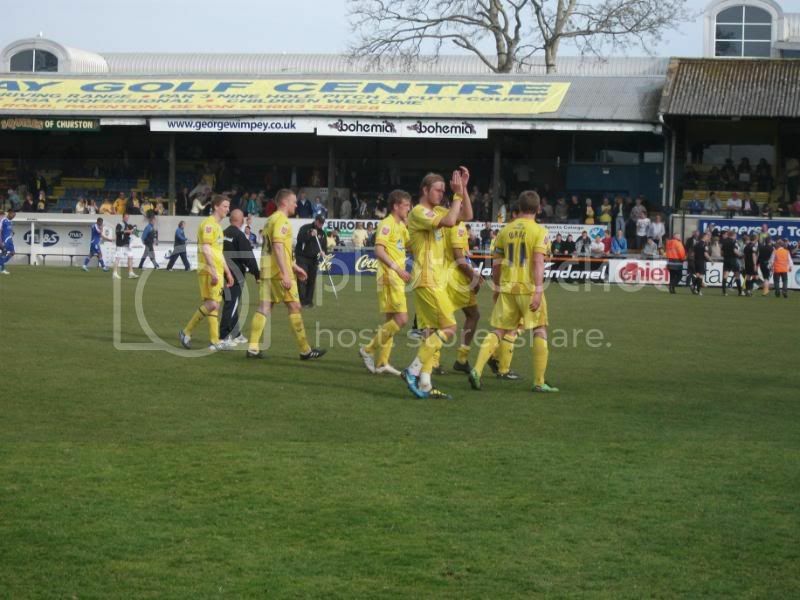 Torquay really are coming good and it was satisfying that we looked so much better than the opposition. Roll on next season if we can keep this unit together. The Gulls really have arrived in League 2 just in the nick of time and should looking forward to next season with a certain amount of confidence. 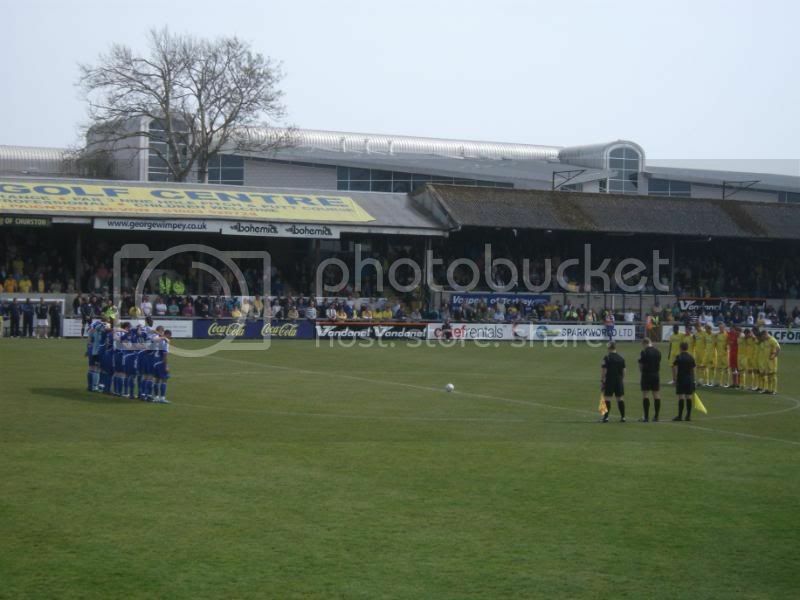 It made a nice change to watch the game today in a nice and relaxed atmosphere at Plainmoor. Five clean sheets in a row in the league. When did that last happen? And what is the record? Ps.. I was going to put that I'll give the answers on Sunday evening but by then I'm sure the usual suspects will have come up with the necessary! I only have two questions, one, how come we are not celebrating promotion instead of just being safe and two, why did we not win today’s game by ten goals. This was always going to be a game that due to both teams knowing they were safe, was never going to see crunching leg breaking tackles, or any players going over the top with any challenge, it was just played in a very good sprite with one team not bothered about wining the game and the other wanting to win it, but going back to old ways by failing to take their chances. With the result not really being that important the fans were all in a very relaxed mood and it’s a good job nothing was riding on this game as the fans would have been in such a different mood when chance after chance was not taken. I was back on the popside where I belong and decided to break my habbit of always being on the halfway line and instead stood up the away end side of the pop with Stuartb, chelstongull and Jon, after first having a chat with Barton Down, then at halftime going down the other end and I did enjoy watching the goal mouth action from much closer up and as it was us who did all the attacking for the whole game, it turned out to be a good decision. Only the one changed made as expected, Charnock in for the suspended Guy Branston and while he made the odd mistake during the game, I’ll be happy to see him playing alongside Ellis (if he is here next season) should we not be able to keep Branston. A perfect minutes silence was observed before the kick-off with only two seagulls failing to show their respect and making the noise those lovely seas birds do, can never understand why people have a problem with them. We went on the attack from the kick-off and were still doing so in the extra four minutes added on at the end of the game, a mixture of poor finishing and some good goal keeping meant it was going to take someone to do something a bit special to get the single goal that gave us all three points and that is what Nicky Wroe did. On five minutes Benyon in the Macclesfield box picked out Muzzy who hit his shot hoping to get it in near the right hand post, the Macclesfield keeper really flapped at the ball and just managed to get it out for a corner. 60 seconds later and Benyon was strong and held off two players and then made the space to fire in a shot from just outside the box, it had the Macclesfield keeper diving low and at full stretch to push the ball out for another corner. Talking about corners, for some reason Nico was not up to his best taking corners today, so often hitting the ball far to low into the box and as a result the nearest defender was winning easy headers to try and clear the danger. Benyon was once again working his socks off and he received a great ball in the box played to him by Mansell, Benyon chested the ball down and hit it on the volley with his left foot, a good strike that pulled out a good save by the Macclesfield keeper. On 28 minutes Ellis had to make a defensive header on the edge of our box, the got so much power into the ball it sailed like a rocket to Muzzy who was out wide on the right just inside our half. He went on one of so manly blinding runs leaving the Macclesfield players around him just standing and admiring his skill and pace. The only thing that let the fine run down was his poor ball into the box that got blocked far too easily on its way to its intend target Benyon, but the block only saw the ball fall to benyons feet who turned and took a shot that also got blocked and this time the ball fell to Wroe on the penalty spot and he should have scored but only managed to find the keeper with his shot. Benyon should have also scored just after the Wroe chance, Muzzy played him in with a perfect pass and Benyon found himself one on one with the Macclesfield keeper and he should have just lifted the ball over the keeper who was going down to try and block the shot, but he hit it low and straight at the keeper. Rendell was another player who missed a golden opportunity that would have seen the team end the first half leading the game, a fine run and perfect low ball into the box by Zebs that Rendell was coming onto near the penalty spot and I was just expecting to see the net burst from as power driver shot from Rendell, only he somehow managed to hit a poor shot over the crossbar. So the end of the first half that had seen us miss so many chances and just one very hopeful shot by the lanky Macclesfield forward from all off 40 yards that went nowhere near our goal and it was time to do what I have watched so many other fans have done for more years than I care to remember and move down the other end of the popside. Zebs and Muzzy were leaving players for dead out on the wings and a great run and low cross by Zebs saw Benyon not quite able to get on the end of the cross, it got knocked out to the edge of the box where Rendell was standing and a good powerful hard shot that was well saved. Benyon then did well to hold off his man and played the ball back to rendell who hit a first time pass to Zebs who then laid the ball back to benyon who made a poor connection with the ball and as a result the shot was very weak. The Plainmoor crowd were starting to celebrate the second the ball had left Zebs head after a good cross played to him by Ellis, it looked certain to go in and must have just missed the left hand post by inches. Muzzy then got injured and O’Kane took his place, it was a shame to see Muzzy get injured as he was dazzling to watch today, yes one run he went on he forgot about taking the ball with him, but with the ball close to his feet he moved it so quickly and had the beating every time of who ever was marking him. O’Kane showed some good skill and made one chance for himself from a tight angle that forced the Macclesfield into a save on his near post, then Benyon with a clear sight of the goal blasted the ball well over the bar with his right foot. Shots were coming in from everywhere and Rendell had his share but he never really hit the ball with any real conviction and most of his efforts on from the edge of the box got blocked with ease. Just when you were starting to think we were never going to score a goal, up steps Nicky Wroe and what a fine goal it was. He picked the ball up in the midfield, went on a run to the edge of the Macclesfield box and hit a great low shot to the left of the Macclesfield keeper, giving him no chance at all to make the save. Rendell did nearly make it two with another shot from the edge of the box that hit the left hand post and the ball then fell to Zebs who took a shot himself, but the Macclesfield keeper made a fine save right by the post. A good performance and a deserved win that showed the real character our players are now showing, lets hope we can keep most of them for next season as if we do then we are going to be a hard team to beat and one you would always fancy to win. This is not an easy statistic to find, and I'm not sure that I am correct, but there was a six game series towards the end of season 2001/02, which seems to be the answer to both questions. Taking Miac's advice (not!) I decided to put this afternoon's match in the background of my mind and enjoyed a superb sunny (20 degrees?) afternoon up at Anthony's training ground watching him train with A Class, chatting to other parents and keeping an eye on Olivia as she rode her bike in the adjoining play park........................Anthony's always been difficult to drag off the training ground, so today when 2 o'clock came I just let him stay on until he was exhausted, Oli was bored and I was veritably aching from arthritis! .................................and old dear poked her head into his stroller the other day and enquired his name ~ "Spongebob" I answered, not caring for her feelings; and I have been feeling guilty ever since as she no doubt believes my youngest son has been lumbered with the latest trendy monicker! Last night I witnessed the most bizarre game of football at under 9 level I have ever seen ~ oh the "usual 1-0 to the A Class" scoreline and a cup final now to look forward to; but the sight of such young protagonists hurling themselves into such a physical battle, regular stoppages as bodies littered the floor of the latest goal mouth challenge and an A Class sending off, all played out before a hysterical and frantic crowd of a couple of hundred was surreal in the extreme.......................funny how cup ties affect young and old alike. Anthony put in probably the best performance I have seen him do, playing with ease on either left or right flank as directed from his bench and slowing the game down or speeding it up at will whilst riding tackle after tackle that threatened to remove his own tackle at the worst of times ~ all with his little shrug and cheeky grin at frustrated opponents.